Doru Frantescu, predicts that the EU will interpret the election outcome as meaning it must refocus its efforts to stimulate Europe's sluggish economy and reduce joblessness. "The signal sent by the electorate is that clearly it wants the European Union to be more effective, it wants it to deliver more results to the citizens, it wants it to solve economic issues and unemployment," Frantescu says. "These are the reasons for which people have turned toward the far left, toward the far right, toward Eurosceptics in general". Frantescu is policy director and co-founder of VoteWatch Europe, a supposedly independent Brussels-based organization that tracked opinion polls in the run-up to the euro-elections. The departing commission president, José Manuel Barroso, appears to agree with Frantescu. "This is the moment to come together and to define the union's way forward", he says, completely untouched by the drama of recent events. "The concerns of those who voted in protest or did not vote are best addressed through decisive political action for growth and jobs, and through a truly democratic debate", he adds, having first thanked all those who voted. "Citizens across the European Union have exercised their democratic right and made their voice count in the European Parliament elections", the soon-to-be departed president says. His statement, in the round is nothing if not a verbose way of saying "more Europe", the standard response of the Apparat to any and every perceived setback. But, in fact, there is nothing in the current results to worry the Commission or the integrationalists. Despite some gains by a fractious and fragmented ragbag of dissident groups, with nothing in common but a dislike for each other, the two main centrist blocs in the European Parliament still command over seventy percent of the vote. That much has been noted in Die Welt which sees the markets reacting calmly to the elections, the paper having them celebrate the "impotence" of the "anti-euro populists". The euro, after falling to a three-month low on the election results, quickly recovered, lifting from $1.3615 to just under $1.3650 by Monday afternoon. The stock markets responded favourably. Milan shot up 3.4 percent, Athens by two percent and Madrid by almost one percent. 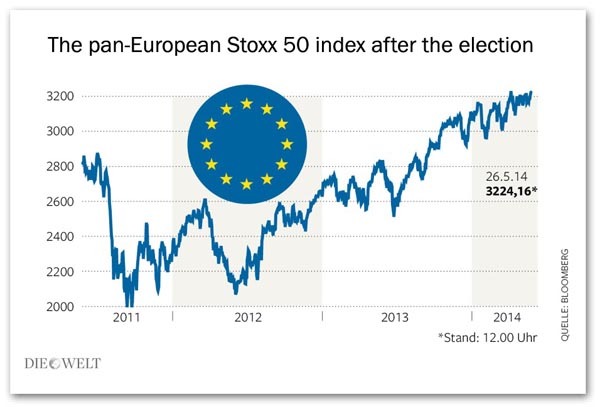 The German stock market index marked a historic high. Dax finished up at 9,876 points, only a few points below the magic 10,000 mark. The cost of borrowing for borderline euro countries also fell significantly. The Italian interest rates on ten-year government bonds were 14 basis points (equivalent to 0.14 per cent) down. The Greeks lost 29 basis points. "Although it is true that euro-sceptics have more seats in the European Parliament, they will not be a force that brings down the whole European project," says Alan Lemangnen, an economist at the French investment bank Natixis. In his estimation, the eurosceptics are "a very heterogeneous group". Only if you count together all kinds of large and small groups on the left and the right,will you make 30 percent, but then only barely. Even then, their policies are "so different that they often fight", he adds. While the "eurosceptics" bicker, the centre-right EPP is likely to remain the parliament's largest group with 211 seats, down from 274. The Socialist group will pull second place with 193 seats, down by a mere three. With the Liberals and Greens taking in 118, that gives them a working majority. As in Germany, these establishment groups are well capable of working together to defend their interests against the electorate. This will easily offset the gains from dissident parties, each with their own agendas and diverse views on the role of the EU. According to the early results, these gained around 130 seats in the 751-member parliament, but the chances of them ever working together non-existant. 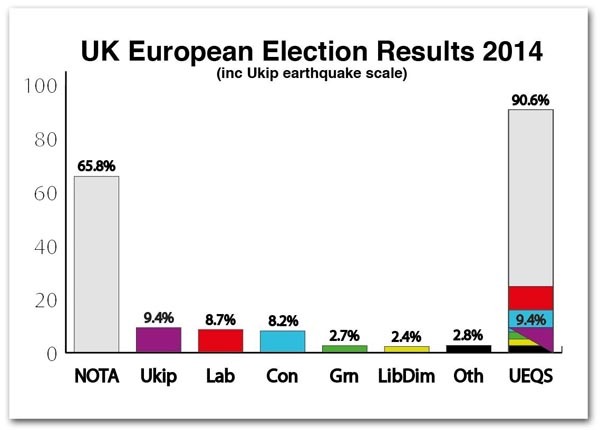 Even in the UK, the so-called "earthquake" gives the Farage party a mere 9.4 percent of the electorate, with a massive 3.2 percent of the vote in the European Parliament, assuming UKIP takes a seat in Scotland. The true "winners" of the UK end of this electoral farce are in fact the losers, 65.8 percent of the voters who walked away from this contest. Their absence leaves a disparate collection of bald men fighting over a very small comb. Less than one in eleven voted for either UKIP or Labour and Mr Cameron's Conservatives get the support of less than one in 12 of registered voters. This enables Barroso to assert that standing together as "Europeans" is indispensable for Europe "to shape a global order where we can defend our values and interests" and remains "confident" that the overwhelming majority of the MEPs elected today will meet this challenge. They will, he declares, "seize this unique opportunity to deliver tangible benefits for the European citizens". And now that the results are declared, "It is now of the essence to have a clear understanding on political priorities for the next political cycle, so that a proper institutional transition according to the treaty rules demonstrates the Union's capacity to act". As yet, the election results have had no impact whatsoever, with Spiegel online regarding the outcome as a "victory for European democracy". In other words, nothing has changed. For the moment it is business as usual, and the march of integration goes on. Small voices in the UK may say otherwise, but these, I suspect, have yet to be heard in Brussels.